1.Spinlogics: Authentica is the most efficient and simplest solution can be provided by blockchain technology to serialize pharmaceutical supply chain. Each item of medicine is attached with an unambiguous QR code, which allows the transparency in the transfer from the suppliers to the consumers through a trusted network verified by smart contracts on a Blockchain. 2. Onward Health: Onward Health is an intelligent treatment adherence platform that delivers predictable health outcomes through improved compliance, remote patient monitoring, and treatment analytics. 3. XMachines: XMACHINES X100 is a rugged mobile robot to Autonomously transport heavy loads within a manufacturing and warehouse facilities which leads to significant improvements in manufacturing and warehouse operations. 4. Soujhe Innovative Health care: IoT Enabled Gamified rehab devices. The innovative element is to help rehab patients recover faster by having them play engaging & immersing games. One other innovative aspect is the use of sensors to capture progress of improvements of these rehab patients. 5. Smart CPR: Building smart and automated Cardio Pulmonary Resuscitation device. 7. Brontobyte: Brontobyte Analytics is a product and service based AI company, with its core capabilities in Machine Learning & Deep Learning models to provide a modern optimized platform. 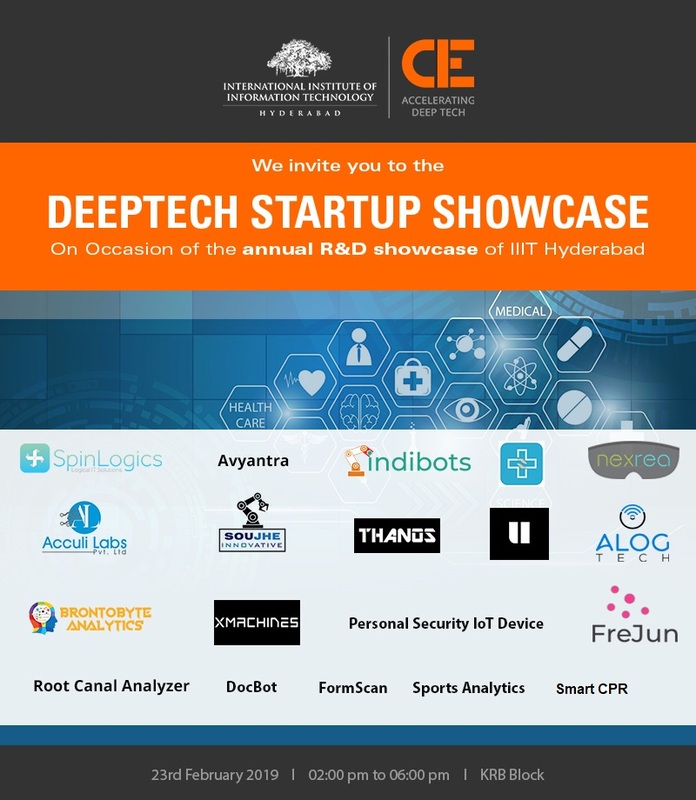 We are working on “DeepHealthCareVision”, a healthcare analytics software, an End-to-End Healthcare Analytics Platform which helps the Hospitals and Diagnostic Centres to improve the patient’s diagnosis and treatment turnaround time. “DeepHealthCareVision” is an exclusive module for oncology which is a customizable dashboard/plug-in to analyse & detect cancer, provide diagnostic suggestions by means of Clinical, Radiology and Pathology visual data. 8. Root Canal Analyzer: Handheld dental device to visualize “dental pulp chamber and canal orifice” for root canal treatment. manufacturer. The automated device will have multiple filtration steps to make ‘Water for Injection’ and a proprietary chemical mixing mechanism to make the sterile peritoneal dialysis (PD) fluid as per prescription by the doctor. 10. Indibots: Indibots Develops robots to clean solar panels. 11. Acculilabs: Lyfsas is a non invasive mobile diabetic screening test with simple test gives wide organ system physio – pathological vitals and overall diabetic health Status. 12. Alog Tech: ALOG TECH is a DIPP recognized deep tech startup developing autonomous systems and equipment to enable Autonomous Logistics. Our first product is ACDC – Autonomous Cart for Distribution Centers. Autonomous Carts are battery powered robotic carts designed to operate safely alongside people within indoor environments such as warehouses and factories. With ACDC, warehouse workers spend less time travelling and pushing, thereby dramatically increasing productivity and reducing pick-pack-ship cycle time. 13. NexRea: At NexRea, they create Augmented and Virtual Reality Solutions for Medical & Education Industries. 14. Frejun:It is working on an AI system that extracts and summarizes the minutes of meeting and action items from the meeting conversations. Thereby, saving time and valuable resources of the company. FreJun desktop app listens to your meeting conversations gives you the meeting summary and action from the conversation using the NLP tools. Users can export the summary and action items to work tools such as Jira, Salesforce, Asana and Etc. 15. Thanos: UAVs/Drones used for commercial applications in India have extremely low flight times thus not allowing the technology to be used to its full potential. This is an even bigger problem for Multicopters which are the preferred variety for Monitoring and Surveillance applications in various domains that include but are not limited to Military, Infrastructure (Railroads, Power, R&B, Renewable Energy, Ships/Vessels). We intend to build an in-house designed multicopter with compatible battery system that can fly for upto 60 minutes (more if possible) so that operations can be conducted continuously without having to carry multiple batteries or look for charging infrastructure in the field.